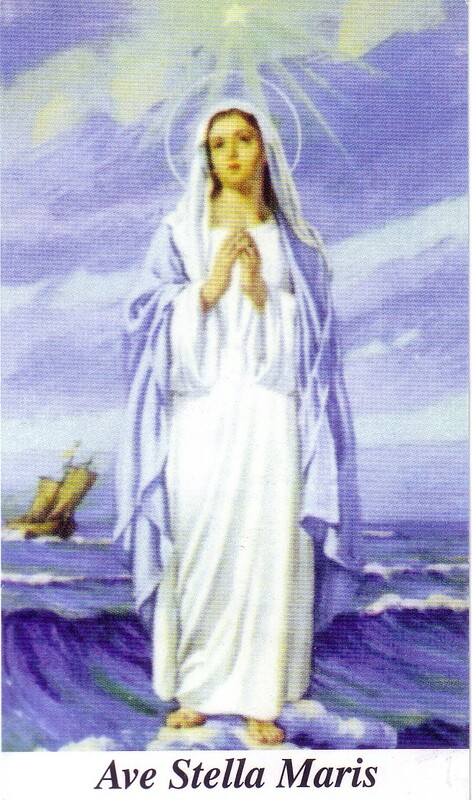 Our Lady Star of the Sea – Stella Maris – is the Patroness of the men who sail the seas. St. Bonaventure reminds us that she also "guides to a landfall in heaven those who navigate the sea of this world in the ship of innocence or penance . . . "
For centuries sailors have sought the protection of the Blessed Virgin under the mantle of Stella Maris, i.e. 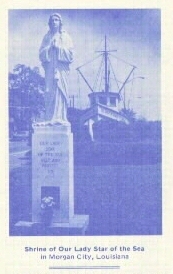 Our Lady Star of the Sea. The first prayer ever said to the Blessed Virgin in our land was the prayer of the Christian Norsemen who came to Vinland in 1002. The most popular prayer at that time was “Ave Maris Stella" (Hail Star of the Sea). O, Mary, Star of the Sea, Mother of God, we present ourselves in Thy sight in all humility to thank Thee for Thy maternal protection. We who are in constant danger from the perils of storms and flooding humbly thank Thee for Thy loving protection, which Thou hast shown our entire area these past years. We offer this through Jesus Christ, Your only Son who lives and reigns with one God forever and ever. The Confraternity of Our Lady Star of the Sea in Morgan City, LA, was established by Bishop Warren L. Boudreaux on August 22, 1979. On December 22, 1979, His Holiness Pope John Paul II officially gave his apostolic blessing upon all the member of the Confraternity of Our Lady Star of the Sea.